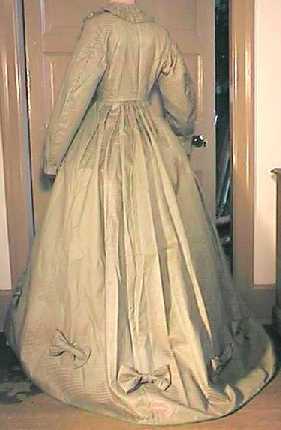 Materials Used: Olive green and cream striped silk, velvet and silk fringed ribbon, glazed cotton lining, 5 whalebone stays, brass hooks and eyes (some missing) and wool hem binding. Condition: Excellent. No holes or wear to the fabric and trim. 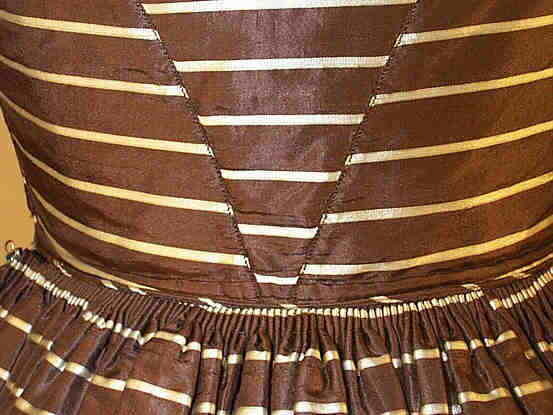 There is a light brown nickel sized stain on the left side back bodice (just below the shoulder seam) and a very faint underarm stain on the left side. Measurements: B, 33"; W, 23"; Sh-Sh, 20"; Sh-W, 13 1/2"; Skirt L, 40"; Hem C, 150". 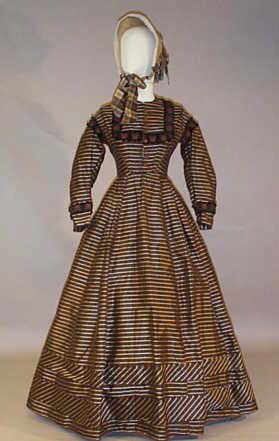 Comments: Raised horizontal woven bands in the silk fabric make the dress appear plaid rather than the stripe it really is. 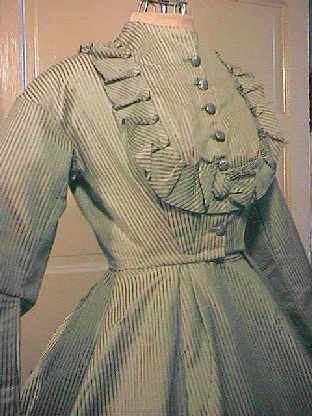 The wide sleeves with epaulette caps, double box pleated skirt and short, straight, piped bodice clearly date this unaltered day dress to the early 1860s. It is exceptionally well made: fully lined and all hand stitched with two inside pockets. Condition: There is slight fading underarms and a 3/4" mend at the waist. Otherwise the condition is excellent. 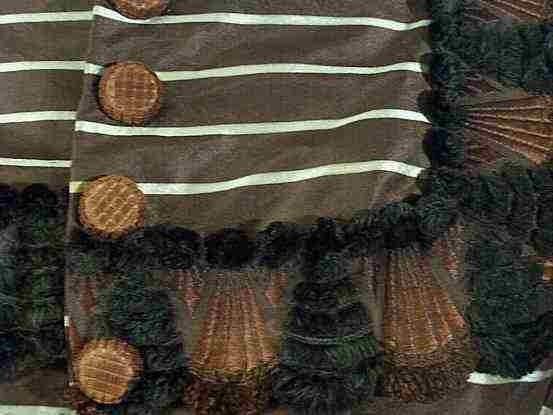 Comments: Details such as bands of bias cut fabric & piping at the waist where the cartridge pleated skirt attaches to the bodice shows a very high standard of workmanship. 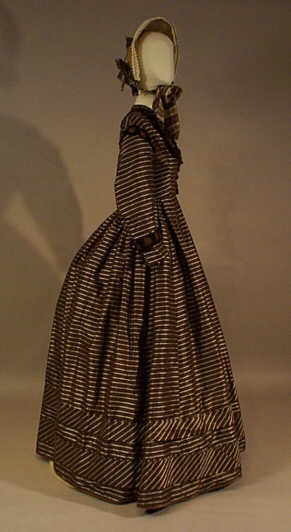 A lovely, unaltered Civil War era dress. 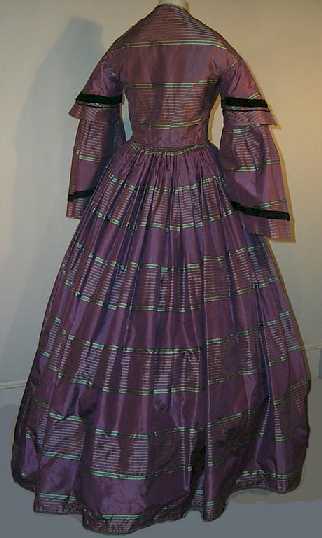 Silk has green, black and white lines on a violet background. 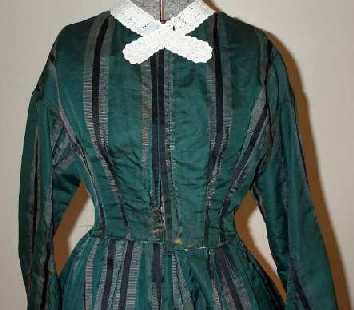 Fitted bodice is boned at darts and has dropped shoulders and cappes epaulettes on the sleeves. 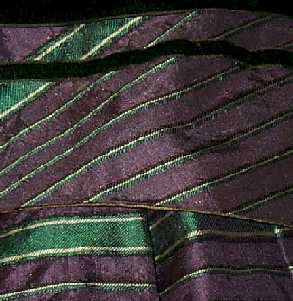 Trimmed with black velvet ribbon and is lined at the cuff with green silk. The inside is lines with ecru polished cotton. Center front hook & eye closure. 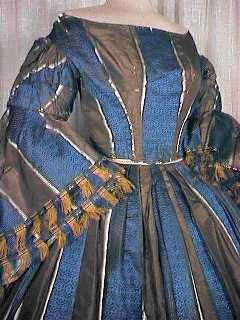 The bell-shaped skirt has 8 gores. Hem measurement of 152". Pocket in center front gore. 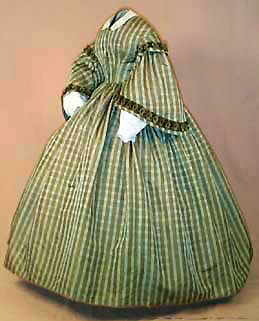 A wonderful late Civil War period day dress in a pale green cotton blend with a fine emerald green stripe. 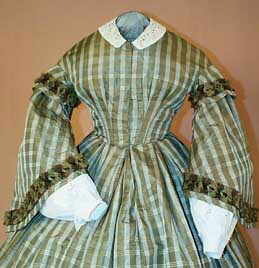 The neckline, bodice and cuffs are accented with ruffles. 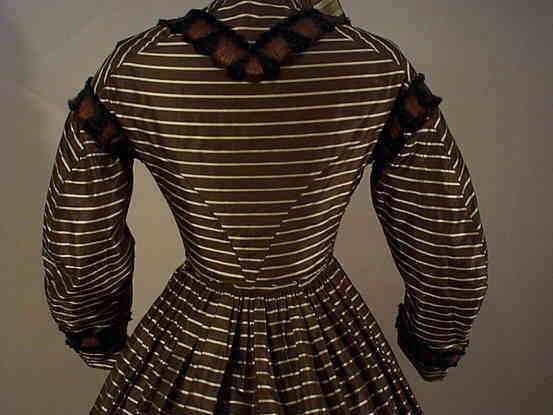 Bows adorn the hemline and front of the bodice. The bodice is a natural waist line with drop shoulders and piped at the armscyes, collar, waist, cuff and sleeve back seam. The back of the bodice is a deep V construction with topstitching. A front hook and eye and button closure. A slit pocket at the right side. Lined in a white polished cotton. Hand and machine sewn with hand sewn buttonholes. 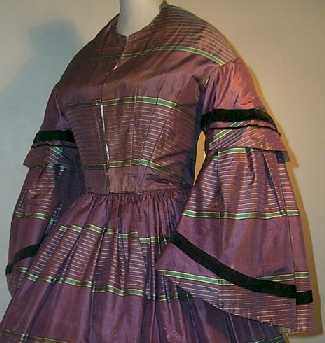 24" Waist - 155" Skirt Circumference. 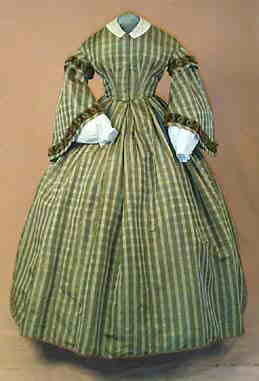 Simply a lovely original circa 1863 to 1865 day dress! 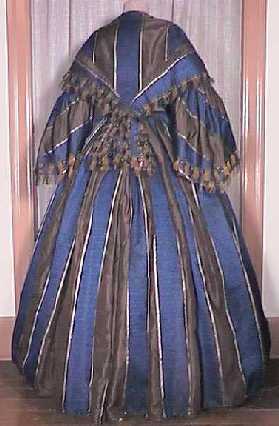 An elegant circa 1855 to 1860 striking rich brown and deep blue striped silk brocade two piece lady's dress with matching capelet. All hand sewn and lined in a brown polished cotton. 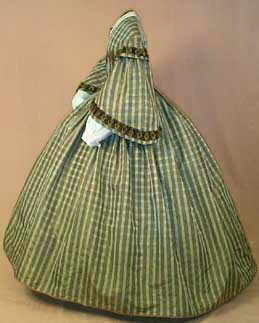 The stayed bodice has a two dart construction and a V back hook and eye closure. 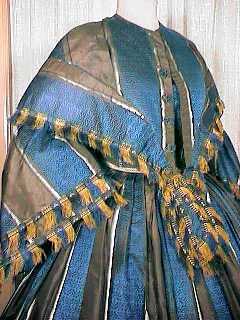 Wonderful capped full pagoda sleeves with drop shoulders, fringe trim and blue silk linings. 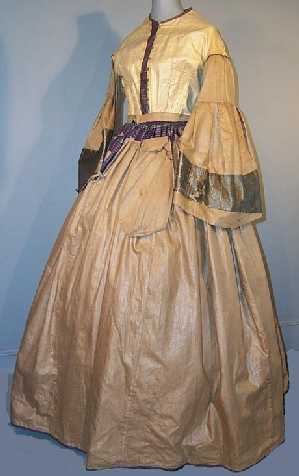 The box pleated skirt and fitted capelet make quite a fashion statement. 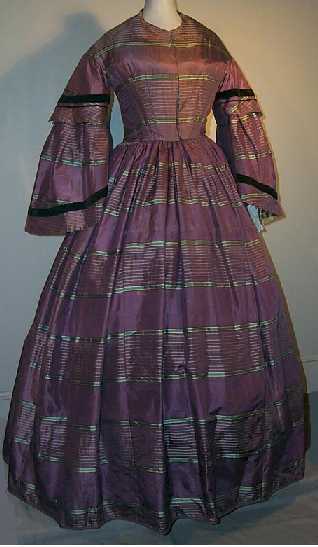 Impressive c. 1860 woven silk dress. 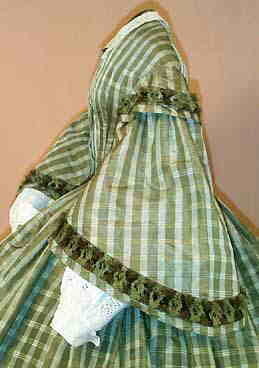 Green with black and grey striped woven into the fabric. 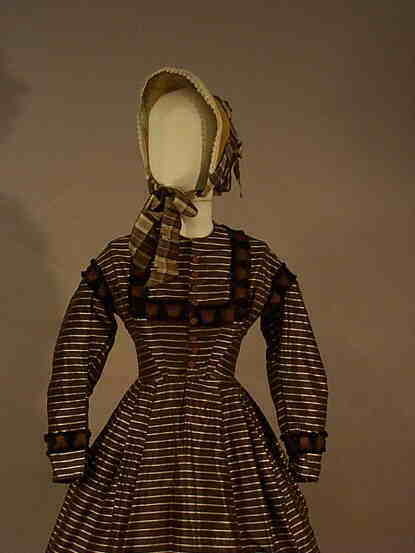 This dress was well-worn - a testament to the times when the Civil War made material hard to come by, and women had to "make do". 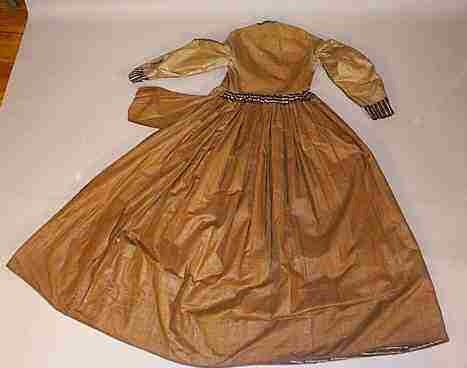 Dress bodice is hand stitched and lined in brown twill cloth. There is one piece of boning in it, and no evidence of any other boning. 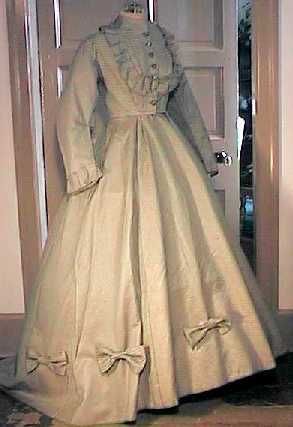 Dress is one piece and hook and eyes up the front. Coat sleeves. Skirt is very full and lined in polished cotton. The hem tape is VERY well worn. The material is somewhat worn from years of wear. There are mends which were done during the War. 27 1/2 inch waist.